There's a new documentary film about legendary Canadian singer-songwriter Gordon Lightfoot titled 'Gordon Lightfoot: If You Could Read My Mind'. Geddy and Alex make an appearance according to a post here. It appears that the film began production back in 2017 according to here. The film will be premiered at the Hot Docs Festival in Toronto, which runs from April 25 to May 5 according to here and here. I couldn't locate a trailer for the film though. Edited by RushFanForever, 14 April 2019 - 03:41 AM. I love the Sundown album. Just brilliant. 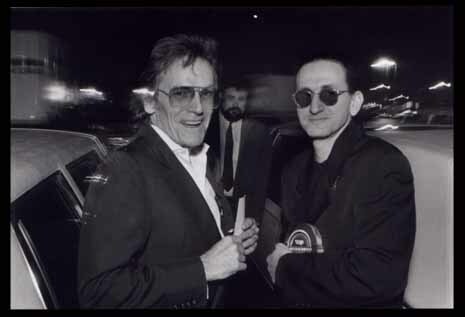 Here's an older photo of Gordon Lightfoot and Geddy Lee below from the original source here. The photo took place at the Toronto Music Awards in December 1989 when Gordon Lightfoot was presented with a Lifetime Achievement Award according to photographer Algis Kemezys. Thats awesome and so is gordon. Love a bunch of his tunes. Funny thing. Gordon rolled through town in the last year or so. Edited by tangy, 14 April 2019 - 04:51 PM. "We're not a bunch of folkie types like Gordon Lightfoot or a bunch of lumberjacks like BTO"
I tried to find the article on line, but had no luck. I guess it was a young Geddy just being honest but not realizing he may have been slightly rude. I guess Gordon didn't mind... neither did Randy, because they are all friends these days. At least that's what I have heard. Oh, back in the day, eh? Great news re doc. Love Gordon Lightfoot. Gordo and Geddo. Doesn't get much better than that. I saw him live a few years ago in South Shore Tahoe!! AMAZING MAN!! "The Wreck Of the Edmund Fitzgerald" RULES!